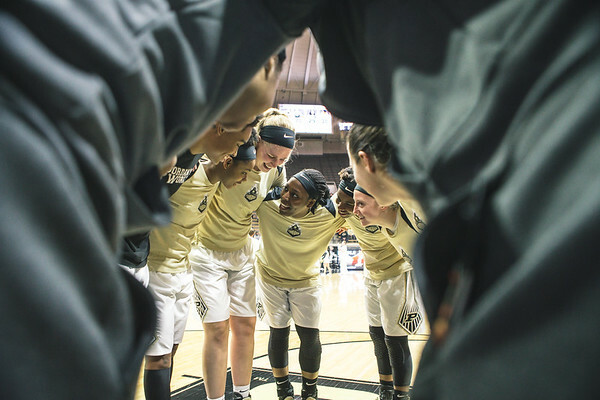 It has been nearly four years since the last time that I photographed a game for the Purdue women’s basketball team. The first and last time that I photographed for the team was in the 2014 NCAA Tournament. It was my first paying gig, and I was so excited to do it. After a while you start to question how well you photographed when you don’t get the chance to do it again. In that time a lot has changed in the Purdue athletic department. You really would not believe how much has changed for the better in that time. Everything has gotten amazingly better making it very cool that I was shooting for them. 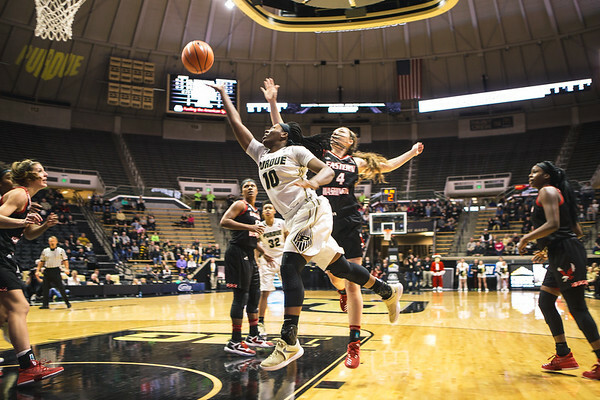 This is the start of three games in four days for the Boilers. They play again tonight against UT Martin. The on Wednesday night they play St. Mary’s with thoughts of an early season tournament trophy in mind. It will be a good test for the team over the course of the next couple of days. It is one thing to play at a high level for one night. 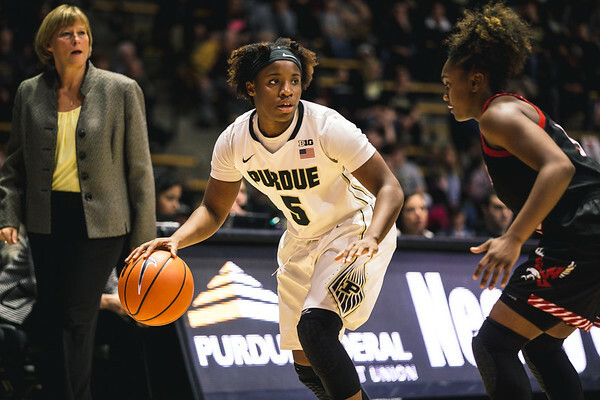 Three games in four days is a great early season test for Purdue. A while back I was watching a Peter Read Miller video where he explained that this great cover to his book was purely an accident. He was shooting the halftime show and had a slow shutter speed still set on his camera when the action started again. At the time I could not believe a pro would make such a mistake. Of course thinking that doomed me. That would eventually happen to me. I was shooting the pre game with my shorter lens yesterday at about 1/1000th of a second slower than I would the game action. I ran to my chair after it was over to shoot the start of the game with my long lens. When I pulled the short lens up to cover a play in front of me it was still set at 1/200th of a second. Luckily for me I was panning well with the action and my athlete is sharp. This is another reason why you should shoot in RAW. Instead of losing the photo I had something a little different for the photo gallery. 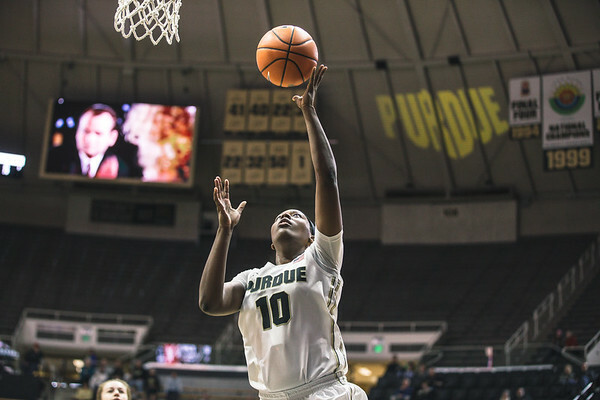 Late in the game a block was followed by a fast break layup for Purdue. When the layup was being made the new screens were still showing the block graphic of Bill Murray from Scrooged. I love how Bill Murray just shows up everywhere now, and apparently he does in my pictures as well. 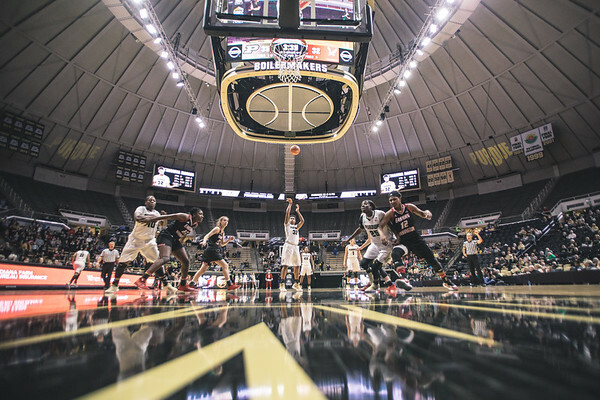 Just looking in the rafters of this photo you can see everything that has changed lately for Purdue. From the new screens, to the new banners, to the projection of Purdue on the ceiling. All of that gives me a lot more to make an interesting background. This week was a slower week for me as far as things that I can post in my photos of the week. You can see my weekly post with my favorite photos of the past week here. This week promises to be fairly busy so It should be much more jam packed.